Thank you all for your kind send off wishes and words of wisdom. Since arriving in Minneapolis on the 18th, I have been busy dodging raindrops and reacquainting myself with Maslow’s famous hierarchy of needs. Ten days into things, I've got the basics of food, shelter, etc pretty much covered and am writing to catch you up on the details of our move. I am a little bleary eyed as I write this, having been kept awake by heavy rain and thunderstorms over the past two nights, with predictions for more of the same tonight. It rained continuously throughout my first eight days here. After a day or two of rest, the rain has returned, with forecasts of hail and 80 mph winds. Right now the only adjective I can think of to describe the recent storms is thunderous. I realize this word choice is completely redundant, but it really is also very accurate. For example, several thunderclaps and lightning strikes have succeeded in setting off car alarms in the neighborhood, adding to the din and my general sleeplessness. At times the sounds of the storm have made me feel like I was in a standalone house on a windswept prairie, instead of on the ground level of an insulated brownstone apartment unit surrounded by other row homes. Sorry to bore you with endless details of the weather; maybe I've been quick to adapt the stereotypical Minnesotan habit of talking about the weather nonstop. Thanks to the weather, I'm getting a lot reading and knitting in at 3 AM. I must take a second to brag that in our amateur moving endeavor, we didn't break a single thing! Everything arrived intact and in one piece. 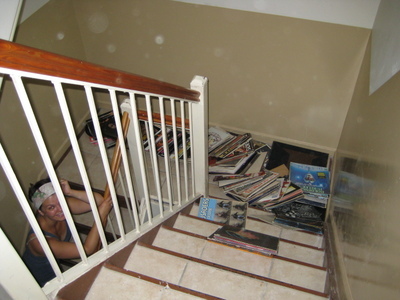 The closest we came to disaster was when a load of B's albums took a spill down the stairs on their way to the moving truck. No real damage was done, but it made me grateful that in knitting, I have found a much less breakable hobby. Dropping my yarn down the stairs wouldn't produce the same effect as B's vinyl collection. Once the truck was loaded up, our cross country drive was blissfully uneventful, filled with This American Life podcasts, Lucinda Williams (whose Live at the Fillmore album earned the #1 spot in our musical rotation), circus peanuts (B’s choice, not mine), and overnight stops to crash with family along the way. This being a road trip, there was optimal time for knitting. Unfortunately, the scenic views inside and out of the car did not cooperate and converge in one breathtaking shot. 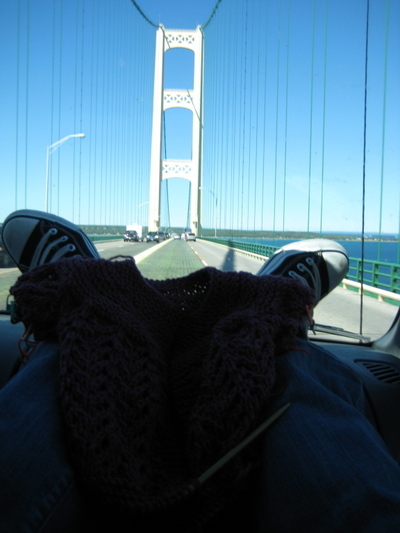 Each is scenic in its own right, so here you have a clear shot of the Mackinac Bridge with EZ's February baby sweater in the shadows. And now for the flip-flop reverse effect, we have a slightly better shot of the same sweater, with the bridge hidden in the glare of the sun on the windshield. The sweater has been seamed and finished, but will remain in the bunchy, blobby state shown to preserve an element of surprise for the recipient. I'll post a final photo in a week and a half once the present has been presented to its owner.